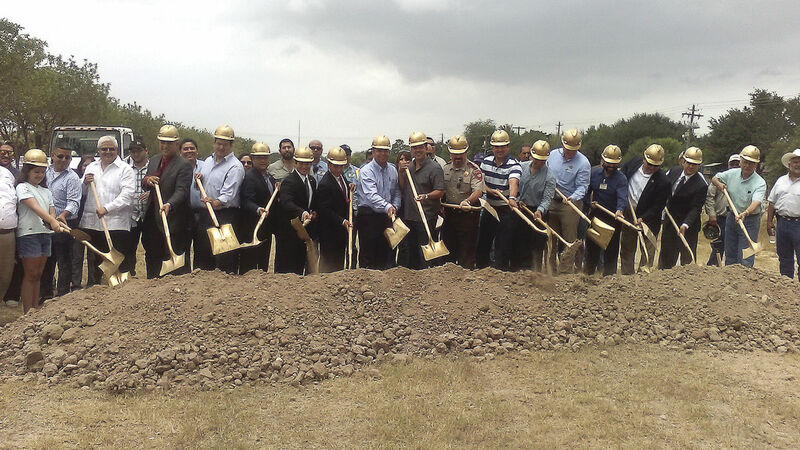 SAN JUAN — Construction began Tuesday on Phase 1 of a regional hike-and-bike trail that will stretch through the cities of San Juan, Pharr and McAllen and eventually link to the University of Texas Rio Grande Valley in Edinburg. Hidalgo County Precinct 2 Commissioner Eddie Cantu broke ground on the $9 million project that will begin in San Juan near an area known as the Bear Trail — named after the Pharr-San Juan-Alamo High School mascot. The dirt path there runs along a drainage ditch that runs east to west just north of the former PSJA High School. The 7.7-mile project began shortly after Cantu won the county seat, he said to a crowded group of elected officials from across the area. Staff at L&G Engineering advised Cantu to attend a scheduled meeting at the Hidalgo County Metropolitan Planning Organization, where he learned about millions of dollars worth of available funding to develop alternative transportation routes within the county. There was only one catch: applications for projects were due in about three months. Cantu, who was not officially in office at the time, tasked his transition team with the development of a regional project. Together, they reached out to the cities of San Juan, Pharr and McAllen to see if they had any trails in the works. Pharr and McAllen had master plans, but neither seemed to connect with each other. “McAllen was working on a north-to-south hike and bike (trail) that wasn’t going to connect with any one city,” Cantu said. Together they devised a new plan and submitted it to the MPO three months later. The committee in charge of distributing the $4.5 million in funding from the Texas Highway Administration ranked the regional project first and awarded it all of the funds. When the county and city officials submitted their plans to the Texas Department of Transportation, officials there didn’t like the idea of bikers or walkers crossing busy intersections, so some adjustments were made. Instead of crossing streets, the trail will go under the roads through a tunnel built to ensure the 7.7-mile trail is as safe as possible. TXDoT officials were pleased with the changes and awarded the project an additional $1.5 million through the agency’s Economically Disadvantaged County Program. However, the agency threw a curve ball about a year ago: the money had to be used by the end of this year. Originally, city and county officials had planned on completing the project in one large sweep that would have lasted two or three years. But because the state funds needed to be spent as soon as possible, officials decided to break it into two phases. The first phase will be 2.2 miles long and begins in San Juan. The trail will run west across Veterans Road and will end one block south of Ridge Road, Cantu said. Hidalgo County will pick up a $2 million tab, while San Juan and McAllen will pay according to the miles constructed within the respective cities. Pharr, on the other hand, backed out of some funding. “They’re supporting the project, but they took some of the money out,” Cantu said.